BURLINGTON, Vt. (CNS) — Following its successful Year of Creation observance, the Diocese of Burlington has designated 2018 as the Year of the Family with a particular focus on Pope Francis’ apostolic exhortation “Amoris Laetitia” (“The Joy of Love”). 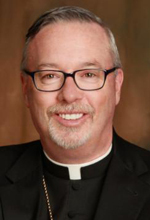 “Like last year’s Year of Creation, this Year of the Family offers us a year to ponder the church’s teaching on the family and embrace it ourselves,” Burlington Bishop Christopher J. Coyne said in announcing the observance. A new pre-Cana program, a World Marriage Day anniversary Mass, a Catholic men’s conference, the annual Family Mass at St. Anne’s Shrine in Isle la Motte, a women’s retreat and a possible diocesan conference tied to the World Meeting of Families in Ireland are planned. Stephanie Clary, diocesan manager of mission outreach and communication, said the year will give Catholics the opportunity to explore, reflect upon and implement the exhortation. In 2017, Bishop Coyne wanted to focus on care for the environment, and the pope’s encyclical, “Laudato Si’, on Care for Our Common Home,” offered the vehicle by which to do that, Clary said. The same thinking is driving this year’s focus on “Amoris Laetitia” with the goal of helping parishioners understand the importance of families in the life of the church, she said. “While certain events during the Year on the Family will focus on specific family situations, the overall focus of the Year on the Family is the joy and love that are experienced by being attentive to the important relationships in our lives and serving as an example of that love, God’s love, for those we encounter,” she explained. Emulating St. John Paul II in “Familiaris Consortio,” on the role of the Christian family, introduced in 1994, Pope Francis seeks to highlight the challenges that contemporary families face and proposes ways for the church to proactively respond in a new way, said Deacon Phil Lawson, diocesan executive director of evangelization, catechesis, divine worship, marriage and family and respect life. “Nowadays, pastoral care for families has to be fundamentally missionary, going out to where people are,” he said. The pope, he added, desires families to exhibit love and joy. “The world needs more of both of these. As Pope Francis states in ‘Amoris Laetitia,’ the strength of the family lies in its capacity to love and to teach how to love and later on he refers to a ‘joy-filled witness.’ If my family and all our families can be agents of love and joy, we will have served our Lord’s mission well in the world,” he said. Michael Hagan, coordinator of religious education and catechesis for the diocese, emphasized that the church truly is a community and noted that St. John Paul many times said the future of humanity is linked to the future of the family. So as persons seeking to do God’s will, it is clear the family is a gift from God to be both celebrated and protected, he said. At the same time, the church recognizes the many difficulties families face today. For some, Christ’s presence in family life can seem completely absent. “The church tirelessly works to strengthen and support families through its accompaniment in pastoral ministry and its celebration of the sacraments,” said Josh Perry, diocesan director of worship. Activities suggested by the diocese to observe the year include families praying and attending Mass together; offering blessings at Mass to families, couples observing wedding anniversaries, engaged couples, children, pregnant women and people celebrating birthdays; inviting the parish priest to bless the home; sharing faith on social media; beginning an intergenerational faith formation program; reaching out to an estranged family member; inviting someone who otherwise might be alone to share a holiday meal or Sunday dinner; and studying “Catholic Household Blessings and Prayers” published by the U.S. Conference of Catholic Bishops for special occasions at home. Urban is content editor/staff reporter for Vermont Catholic magazine, the official publication of the Diocese of Burlington.